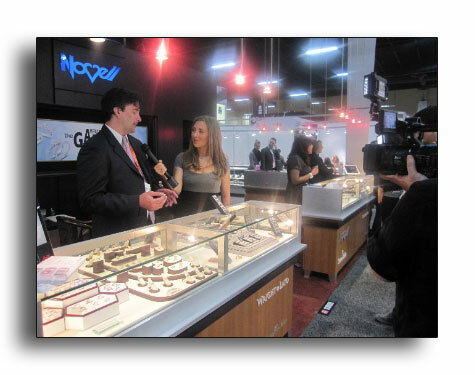 See Novell in Behind the Scenes with Engagement 101 TV. Novell was recently featured in Behind the Scenes with Engagement 101 TV, a yearly feature brought to you by Your Engagement 101. Filmed at JCK’s Jewelry Fashion Week (an annual trade show), Your Engagement 101 covers everything from red carpet events to interviews with jewelry designers, and their cameras were literally everywhere. New episodes will premiere later this summer, but you can check out some previews at Behind the Scenes with Engagement 101 TV right now. JCK Show News – See New Wedding Bands at JCK Show. Debuting at the 2010 JCK Show in Las Vegas – Novell’s TATU wedding bands. The future for wedding bands will arrive at this year’s JCK Show in Las Vegas! Novell will be unveiling a very original concept for wedding bands and jewelry in general – designs inspired from actual tattoo themes. Rings in the new TATU Collection are created in stainless steel or palladium, and a select few have been fashioned especially in platinum. Additional wedding band styles produced with sterling silver and black diamonds will also be available. 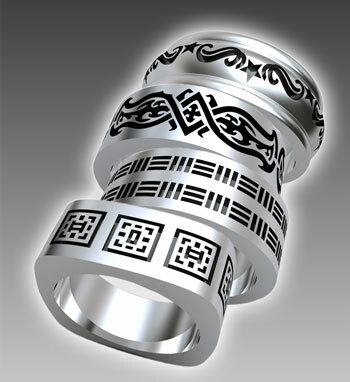 TATU wedding bands will be offered through authorized Novell retailers over the summer. The JCK Show is a jewelry industry-only event that will take place June 4 through June 7. Jewelry industry professionals can visit Novell at booth 5081. View other wedding bands and bridal jewelry that Novell will be featuring at the 2010 JCK Show in Las Vegas. 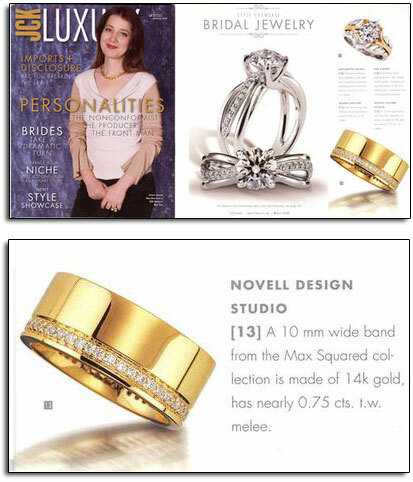 Novell palladium wedding band style LNQP118-6GCX was featured in “Best of the Best: JCK Jewelers Choice Awards,” a supplement which accompanies the April 2009 issue and is also bound into the JCK Las Vegas Show Guide. This style recently earned 3rd place in the Palladium Jewelry/Under $2,000 category for this annual jewelry industry contest. Other finalists were Diaco Diamonds and Simon G. Over 16,000 retailers participated in the voting! Classic palladium wedding band style is recognized by the jewelry industry. Learn more about choosing palladium for your wedding band. Palladium wedding band is a JCK Jewelers Choice Award Finalist! 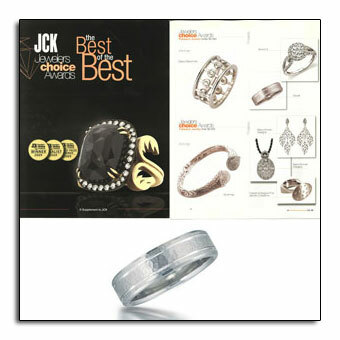 Novell was a finalist in the 2009 JCK Jewelers Choice Awards Contest. Our palladium wedding band style LNQP118-6GCX (shown above) placed 3rd in the Palladium Jewelry/Under $2,000 category. Over 16,000 retailers voted! The winners for all categories were formally announced in the March issue of JCK Magazine. A product photo was featured in the “Best of the Best” JCK Jewelers Choice Awards supplement, which accompanies the April issue and also bound into the JCK Las Vegas Show Guide. Visit www.novelldesignstudio.com to find an authorized Novell retailer. Read more about Novell and palladium. 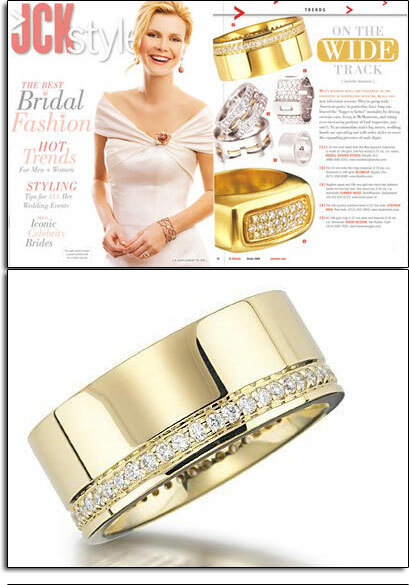 Palladium wedding bands in JCK Magazine’s “It List” article. 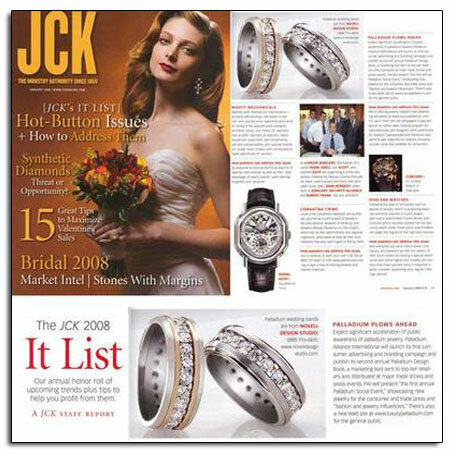 The January 2008 issue of JCK Magazine features Novell palladium wedding band styles L1106-8GCC (8mm wide with 23 x 0.10 round diamonds) and L1102-8GCC (8mm wide with 23 x 0.10 round diamonds) on page 73. The “It List” article focuses on jewelry trends for 2008. Download the JCK Magazine editorial feature. Palladium wedding bands featured in JCK.